Vinyl plank flooring is a newer system for achieving a high-end look that has been making the custom home builders and buyers in Calgary take notice. At Fine Line Homes, our building philosophy has always been to use the latest innovations on the market to advance our goal of making our clients’ custom homes both eco-friendly and affordable. Vinyl plank flooring offers several advantages over both natural and engineered wood flooring, and is more damage resistant than most laminates on the market. 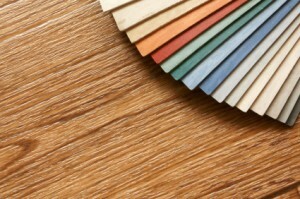 No doubt about it, hardwood floors look great and come in an almost endless variety of colour options. The natural variations in the wood are difficult to fully duplicate with synthetics, however manufacturers are getting better and better at perfecting this art. Whether natural or engineered, though, hardwood floors are expensive. And other factors to consider involve their ecological impact. Many of the most sought-after hardwoods are not grown on this continent, and are tropical in origin. They need to be shipped to North America using pollution-causing barges and trucks. And sometimes these woods have been illegally logged in areas already suffering from deforestation, and it’s often difficult to tell where exactly a product comes from. A hardwood floor, no matter its origin, has to be finely sanded and stained. Many people react badly to the toxic fumes involved with staining, and the sanding process can be very hard on those with asthma and allergies. A wood floor is also quite soft and can look rough very quickly, which has people sometimes replacing it or refinishing it only after a few years. Vinyl plank flooring offers significant cost, installation and ecological benefits that wood products cannot match at any price. Foremost among its advantages, vinyl plank flooring is inexpensive while still looking very beautiful and can look and feel just like high-end hardwood. The cost savings are not all in the material, either. Some vinyl plank flooring is free floating, and does not need to be tacked or glued into place due to its flexibility. This makes it faster to install, lowering labour costs. Whether installed over a slab or a subfloor, vinyl plank flooring flexes with the subsurface, and the weight of the product as a whole keeps it put where you laid it. Vinyl plank can also be very water tight making it a great option for wetter areas like a bathroom and kitchen. Most products are created from recycled material and are certified as low VOC – meaning they produce less off-gas. The most ecological feature of the product is how wear and damage are handled. The floor will never need sanding, stripping, or be stained, or cut for repairs. Replacing a plank is simple and most products have 30-35 year warranty and wear very well. Vinyl plank flooring has impressed Calgary home builders and us at Fine Line Homes. There are many options available to personalize your custom home – contact us today!